Every afternoon we process the artifacts we found during the morning. 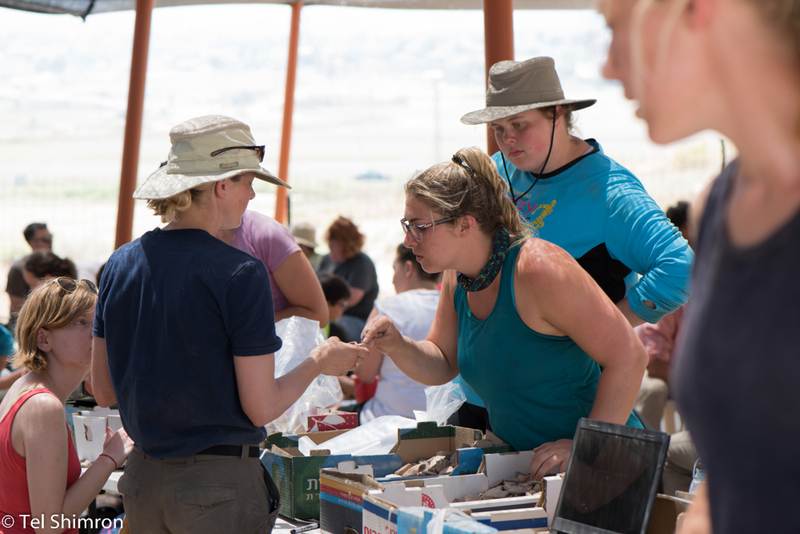 Processing the artifacts includes a range of activities, one of the most important of which is "reading the pottery." What exactly does that mean, you ask? Well, we wash the pottery and set it out to dry overnight. The next afternoon we sort each crate of dried pottery into diagnostic and non-diagnostic sherds. Rims, handles, bases, and decoration are aspects of a vessel which help us identify and date them. Body sherds without any distinguishing features are less immediately helpful. Once we've sorted the sherds, we identify each type of vessel present and then suggest a date. At a most basic level, for each bucket of pottery we "read" we are interested in identifying the latest pottery present as well as the most common, or predominant, type present. (Specialists and archaeologists working specifically on the pottery of a given period will ask many more questions.) Once we have identified the pottery, we can date the layer from which it was collected. (Ceramics are one of our most important tools for dating what we excavate.) And there you have it, that's what we mean when we say we are "reading the pottery." The pictures above show area supervisors and the co-directors reading pottery. The picture below shows the drone taking a photo of Grid 92.